Since it's a holiday, Christian and secular, here are a couple things for you to enjoy. Secondly, I shared a few months ago how I was having some success in having the birds that come to my window feeder eat out of my hand. Well, it is continuing and I finally was able to get a shot of one. This is a Tufted Titmouse. That's my hand right below the feeder. This bird just landed and is taking off with a "goodie" he found. 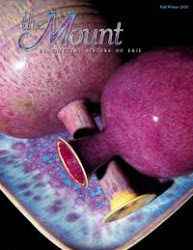 You can view lots of stories about the Holy Week/Easter events here at the Mount on our website. They were all quite wonderful (but of course I'm terribly prejudiced)!